On 10 October 2018, the 16th World Day Against the Death Penalty will take place. This year, the aim of the World Day is to raise awareness of the inhumane living conditions of people sentenced to death. 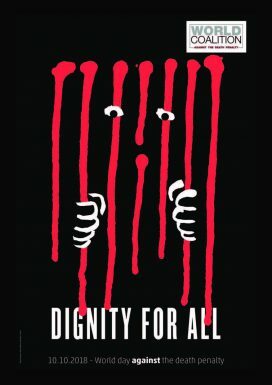 Although people on death row are entitled to the same basic rights and treatment conditions as other categories of prisoners, as set out in the UN Standard Minimum Rules for the Treatment of Prisoners (the Nelson Mandela rules), many testimonies document the inhumane living conditions that people sentenced to death endure. In addition, people on death row have very little contact with their family and lawyers, as access to death row is often very limited. Therefore, the conditions of detention affect not only the person sentenced to death but also their families and their relatives.